The unsightly white discolorations on the surfaces of your front teeth are normally a result of calcium loss from the enamel. Wearing orthodontic braces as a child is the most common cause of this condition. However, the spots also come from eating foods and drinks high in acids as a youngster. Besides making a smile unattractive, the spots make teeth sensitive and prone to further decay. There is now great news for people who would love to rid their teeth of these unsightly spots. Icon is a revolutionary new technology that rebuilds enamel surface permanently and restores teeth to the uniform color of the surrounding teeth. The treatment is quick, easy and affordable with no shots or driller required. Icon makes the spots completely disappear, as you can see from these before and after pictures. White spot removal for our patient who's getting married in 6 weeks. 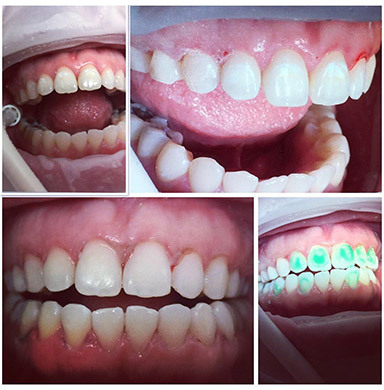 See the before and after picture as well as a photo of one step of the multi-step process with the green conditioning gel on the teeth. The process only takes about an hour. As you can see - a great result. Our patient was very thrilled! Give Boston Smile Center a call at (617) 739-1017 for a no-charge consultation with Dr. Sasson!